What a Girls Wants Guest Night Committee included (l-r) Deb Niekamp, Susan Shields, Susan Fowble, Deb Shiverdecker, Desteni Mason, Vicki Cost and Kristina Heath. GREENVILLE – Greenville Business & Professional Women’s Club guests and members recently enjoyed shopping, food and fashion at their annual guest night What a Girl Wants event on Oct. 11. The evening started with shopping in downtown Greenville at Merle Norman, Sadie Grace, Sweet Annie’s Cabin, Youniques, Expressions of Tyme, Natural Path, Shelly’s Antiques & Décor, Wielands, and 4 One Apparel in Arcanum. The event then moved to the VFW on Ohio Street with social time and appetizers catered by J’s Country Store. Many silent auction items were available for bidding along with shopping at various vendor tables. Several door prizes were given out and a 50/50 raffle drawing was held. Committee chair Debbie Niekamp along with committee members Susan Shields, Desteni Mason, Kristina Heath, Deb Shiverdecker, Vicki Cost and Susan Fowble treated those in attendance to a fashion show with Kirsten Bergoff showing styles from Sadie Grace and Heath describing designs from 4 One Apparel and Youniques. The super raffle was launched with a chance to win one of five prizes: a two-night stay at the StoneHead Ridge Cabin in Brown County, Indiana (Debbie Niekamp); a Frederic Duclos Sterling Silver necklace and earrings (Wieland Jewelers); a 39-inch Element Smart TV (Your Expert Mortgage Team of John and Kristina Heath); Suds in a Bucket Cleaning/three hours (Loure Bohn); and a three-speed hand blender (KitchenAid Experience). Super raffle tickets are available at Merle Norman at 309 S. Broadway, Greenville, or by contacting Susan Shields at 937-548-2592, Debbie Niekamp at 419-305-2178 or any BPW member. The drawing will be held at the club’s meeting on Dec. 13. The winner does not need to be present to win. Tickets are $2 each or six for $10. The BPW Club thanked the following vendors, silent auction donors and members for making this event a success: Deb Niekamp, John and Kristina Heath, Loure Bohn, Wieland Jewelers, KitchenAid, Sadie Grace, Youniques, 4 One Apparel, Pam Sharp (Merle Norman), Leona Douglas (Brown Bag Soap Company), Park Lane Jewelry (Glenna Martin), doTERRA (Sheila Voisard), The Flower Patch, Hairology Off Broadway, Darke County Center for the Arts, Greenville National Bank, Second National Bank, Greenville Federal Bank, Leigh Fletcher, Mary Piel, Creations Salon, Helen’s Flowers, Longaberger (Kathy O’Dell), Mary Kay (Brenda James), Damsel in Defense (Melissa Barhorst), Pampered Chef (Tammy Riffle), Scentsy (Jordan Hart), Sunset Awards, Susan Fowble, Susan Shields, Biller Stamps & Engraving (Maria Moore), Blue Lantern Tea House, Casey’s, The Coffee Pot, Darke Co. Park& Recreation, Domino’s, Hansbarger’s, Hot Heads, JT’s Brew, Kennedy Vineyard (Louisa Kennedy), Eileen Litchfield, Mason Knows Mortgages (Desteni Mason), McDonalds, The Merchant House, Montage, Norwex (Tammy Dietrich), Nature’s Path, Pink Zebra (Brenda Dirksen), Plexus (Sonya Crist), Professional Eye Care, Posh (Kim Bohlet), Rapid Fire Pizza, Signature Home Style (Hillary Schlieger), Tastefully Simple (Deanna Harmon), The Bistro, Betty Via, Thirty One (Kristen Harmon), Escape Spa (Amanda Baker), Sloopys, Buffalo Wild Wings and VFW Post 7262. The Greenville BPW Club’s mission is to achieve equity for all women in the workplace through advocacy, education and information. 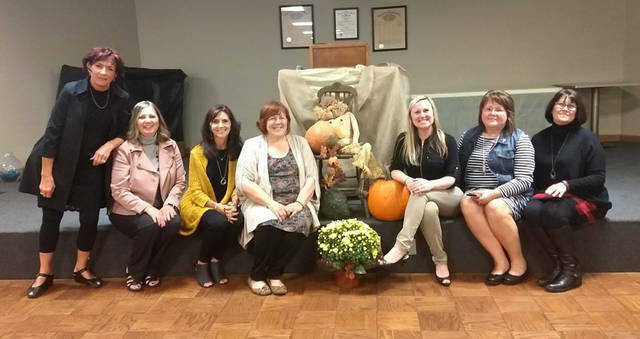 The club holds fund raisers throughout the year to raise money to grant scholarships to the young women of Darke County. Evening meetings are held the second Thursday of every month for a dinner meeting. Those interested in learning more about the Club can contact Membership Chair Sonya Crist at 937-423-3657 or sonyacrist@gmail.com.